Level-5 and Brownie Brown collaboration Fantasy Life is shaping up to be pretty special, if the super-cute video below is anything to go by. Revealed this past weekend at Level-5's regular press event, the video shows off some of the game's anime-styled cut scenes as well as in-game footage of the fantasy world itself. As you'd expect from a collaboration between Professor Layton team Level-5 and Brownie Brown — responsible for A Kappa's Trail on DSiWare as well as Magical Starsign and more — it all looks rather sweet. 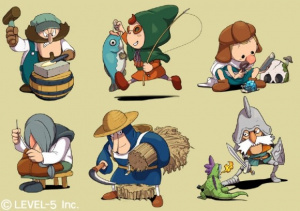 Fantasy Life is out in Japan next year. It does look cute. But what does it do? What sort of game is it? Looks kind of like a Rune Factory. If it is like that, then I'll wait for this to come out instead of getting a RF. I thought the article said Final Fantasy. Some sort of fantasy RPG with network capabilities is all I get from the Japanese subtitles. But just look at it! So cute. @AtomicOtaku It said Fantasy Life. Not Final Fantasy. And it's Level-5, not Square Enix. This game is turning out pretty well so far. Also, I definitely think I want this. Hope it comes stateside. Come on. Plz come to the states and outside of Japan. I love Brownie's games. Heyyy this does have combat. This just skyrocketed up my wishlist. Has it been confirmed for NA yet? But you can play through the whole game without combat. I'm really hyped for this game, and hopefully Level-5 has the heart to put this out overseas. It is currently my #1 most wanted. From what I can make out, this is an Simulation/RPG with 20 different ways to play. Fighting monsters as a soldier or tilling your crops as a farmer, I can't wait to hear more on the other jobs. With Level-5 and Brownie Brown collaborating, how can you not end up with a super cute game? _ Looking forward to more news about it. @pocket_arsenal - And don't forget Sword Of Mana. I thought it was a DS game for a second. I know. I just thought it was at first. I've always liked Brownie Brown, but never LOVED them as they put out obscure uneven titles like A Kappa's Trail (mentioned above), Blue Dragon Plus, and Sword of Mana (really not anything like Secret of Mana), also some moderately cool ones like Magical Starsign. Quite possibly the only exception was Mother 3 and it never saw release here. "New Fantasy Life Trailer is the Cutest Thing You'll See Today"
Eh...I'll get Animal Crossing 3D instead. When it comes out, that is. This looks great! The art style reminds me of Little King's Story. I definitely want this! Awesome trailer! It's definitely on my radar now! @3,7: At first glance, "Final Fantasy" was the first thing that crossed my mind when i saw the word "Fantasy". Did that dragon just... eat.. the little birdy? For that it must be slain! The moment it gets a release date, it gets pre-orderd! "Did that dragon just... eat.. the little birdy? For that it must be slain!" I actually think the birdy wanted to clean the teeth! On a sidenote: The arcs behind the dragon reminded me of one of the enviroments from Xenoblade chronicles!